Early Childhood Experiences in Language Arts 11 Edition EARLY CHILDHOOD EXPERIENCE IN LANGUAGE ARTS: EARLY LITERACY, Eleventh Edition responds to national legislation, professional standards, and public concern about the development of young children's language and foundational literacy skills by providing current research-based instructional strategies in early language development. Activities throughout emphasize the relationship between listening, speaking, reading, writing (print), and viewing in language arts areas. This book addresses the cultural and ethnic diversity of children and provides techniques and tips for adapting curricula. Theory is followed by how-to suggestions and plentiful examples of classic books and stories, poems, finger plays, flannel board and alphabet experiences, puppetry, language games, drama, and phonemic and phonetic awareness activities. 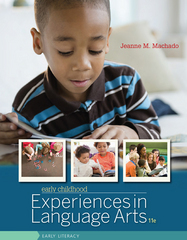 Readers will also learn how, as teachers, they can best interact with children to promote appropriate language development, and how they can create a print-rich environment in the early childhood classroom.